I know I’ve been posting a lot of pesto recipes lately, but can you blame me? I love making one batch of pesto and having on hand to make several dishes throughout the week. 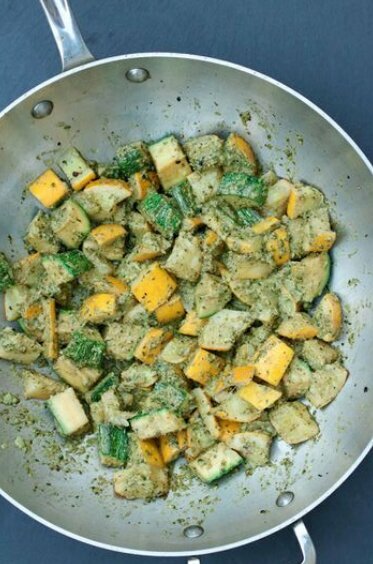 It pairs so nicely with so many different types of summer dishes, including this simple recipe for sautéed summer squash. I have to admit, I probably wouldn’t have thought to put pesto on summer squash until I had a very similar dish at one of my favorite places to eat out, Urban Plates. The dish was so, so tasty and fresh that I knew I had to replicate it at home. Dice squash into 1 inch pieces. Heat a large skillet or sauté pan over medium heat and add avocado oil. After 30 seconds or so heating the oil, add the diced summer squash and sauté for about 3-5 minutes until cooked through. 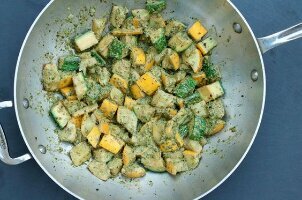 Once cooked, remove the pan from heat, add ½ batch of pesto and combine well.